Here at 'Mormon Moms' we love to support women in the home; in their most important calling, that of raising the next generation of children in the admonition of the Lord. That is our main focus and our mission. So, we're happy today to share with you a special story of a small business, TRUE CREW SOCKS, in Washington State, partially run by Stacey, a stay-at-home mother of five ,who believes 'strongly in the product and in the people who created it'. That endorsement, right there, helped us know that we wanted to share her story. I decided to let you just tell you in her own words about this business as I might not have done it justice had I attempted to edit. "Roger Bird is the creator/owner/designer and shipping dept of True Crew Socks. He currently teaches Gospel Doctrine in the Bellevue Ward (Washington) and his wife Andrea is the Primary President. Roger runs a furniture business out of his house, Olympic Furniture. 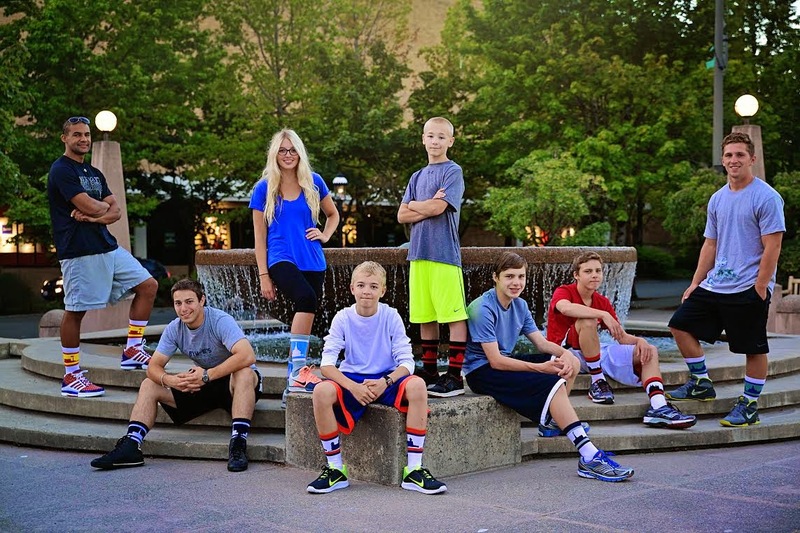 "Our socks were modeled after the popular Strideline socks, started by a couple of local Seattle kids a few years ago. City socks have been popular ever since. (The company got so popular that the creators dropped out of school at U of W to run their business.) When one of Roger and Andrea's kids asked for a pair of Seattle city socks last Christmas, Roger thought, "Man, these city socks are awesome. Wouldn't it be sweet if we could buy a pair with the LDS temple? ... and True Crew Socks was born. "True Crew Socks launched in the summer of 2014 and made our first appearance at a booth in the shadow of the Manti Miracle Temple Pageant. Our fan base quickly grew as athletes bought our socks in their school colors, missionary moms (and girlfriends) sent temple socks in care packages, and word spread through social media. True Crew Socks are showing up at ward activities and stake BBQs, youth temple trips, family vacations, EFY, church basketball and even inside a wedding gift or two. We now carry 10 styles (two SL, two Provo, Manti, Mesa, Rexburg, DC, Seattle & San Diego) and hope to add a new temple style every quarter. At this point, the more socks we sell, the more designs we can create. We can do custom designs and colors as well, with an order of 50 socks. In other words, we can do any LDS temple in any color, with a preorder of 50. This process takes about a month. For Christmas, we are offering gift wrapping for $3...and we will ship direct to anyone in the US for you. LDS Missionaries, grandkids, college students studying for finals, newlyweds...We wanted to make it as easy as possible to order, send and give temple socks this Christmas. (Andrea is the gift wrapper and cheerleader). Socks are made in the USA, leading to a higher quality product for our customers. One size fits most, adult 7-11. Socks will shrink up a bit if put in the dryer. Acrylic/nylon blend with arch support and mesh top to wick moisture. "As an aside, if you click on the "Contact" tab at True Crew Socks, you will see my twins :) We rounded up kids from our Stake for our first photo shoot. My kids, Roger's kids, newlyweds, a recently returned missionary and a neighbor. No budget for shoes or clothes, the kids just wore what they had!"